A short drive north of Jackson, Mississippi brings you to an unusual attraction: the Mississippi Petrified Forest, the only one of its kind east of the Mississippi River. This National Natural Landmark brings millions of years of history to light as you examine the giant petrified log sections exposed by wind and rain erosion. Once part of a primeval forest, these giant trees were uprooted 36 million years ago and brought here by a prehistoric river. Submerged beneath layers of mineral-laden wet soil and silt, they were transformed into stone logs weighing 166 pounds per cubic foot! A printed trail guide shows you 26 points of interest along an easy nature trail about six blocks long. 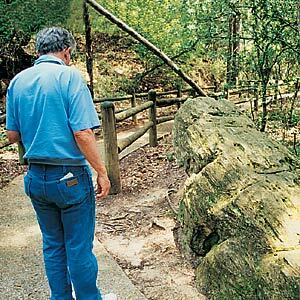 It takes about 20 minutes to see all the petrified logs, which are easily visible on both sides of the trail. At the end of the trail is a museum where you can browse through interesting displays of petrified wood, fossils, minerals and other natural objects. The Petrified Forest is about 17 miles north of Jackson on U.S. Highway 49. At Flora, take State Highway 22 west about 1 mile to the forest. Admission is $5 per adult and $4 for children. It's open daily except Christmas Day. To learn more, call 1-601-879-8189 or log on to www.mspetrifiedforest.com.